The Saputo Cheese Frigo Cheese Heads Cheesetoberfest Sweepstakes is open to all legal US residents physically residing in the 50 United States and District of Columbia who are 21 years of age or older. The Saputo Cheese Frigo Cheese Heads Cheesetoberfest Sweepstakes ends at 11:59:59 PM ET on October 31. To enter the Sweepstakes, log on to CheeseHeadsWisconsin.com and provide your valid e-mail address. Then, complete the Sweepstakes registration form. Three hundred (300) first prize winners will receive a steel growler. The approximate retail value (“ARV”) of a First Prize is $17. 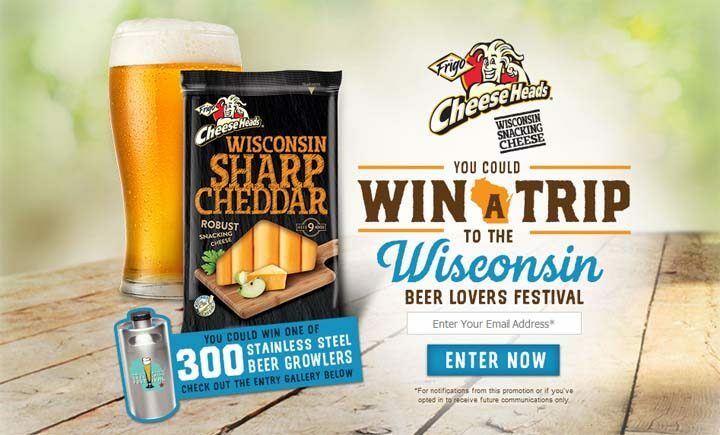 One (1) grand prize winner will receive a trip for Grand Prize Winner and three (3) guests of his/her choosing to attend the Wisconsin Beer Lovers Festival in Glendale, Wisconsin. Grand Prize includes roundtrip coach-class airfare for the Grand Prize Winner and up to three (3) Guests between the major commercial airport closest to Grand Prize Winner’s residence and Milwaukee, Wisconsin; two (2) nights hotel accommodations at a hotel selected by Sponsor in its sole discretion; four (4) tickets to the Wisconsin Beer Lovers Festival 2018; access to a VIP reception; a tour of a local brewery; and $150 in travel cash. Beer or alcoholic beverages are not included in the Grand Prize. There is one (1) Grand Prize available in this Sweepstakes. The ARV of the Grand Prize is $4,900. The total ARV of all prizes available in this Sweepstakes is $10,000.